Gartner just released their “Top 10 Technology Trends for 2017”, and the future is bright for intelligent virtual assistants and customer service automation! 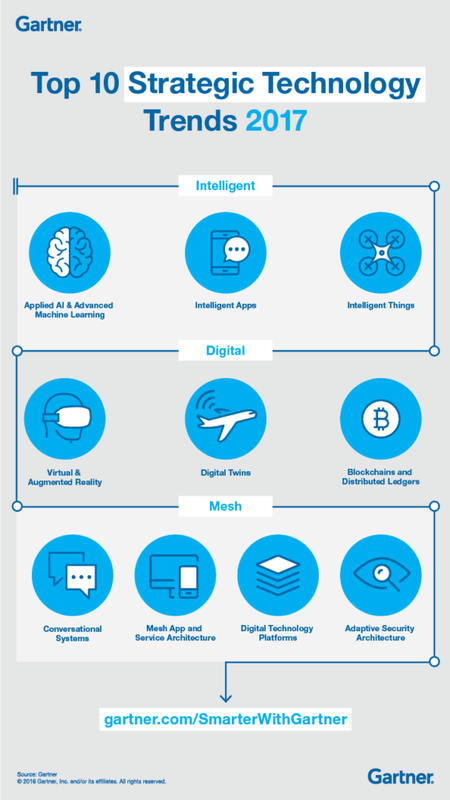 Gartner defines a strategic technology trend as “one with substantial disruptive potential that is just beginning to break out of an emerging state into broader impact,” and they claim that 2017 will set the stage for the “Intelligent Digital Mesh” as technology evolves and the physical and digital worlds become increasingly intertwined. Of the 10 trends Gartner highlights, a number of them speak directly to the ways our Intelligent Virtual Assistant solutions are already revolutionizing customer experience and helping companies scale their service delivery. Our Intelligent Virtual Assistants use advanced natural language understanding to communicate conversationally across multiple channels, as well as gather and leverage real-time data to improve user experience, streamline support, and provide a seamless omni-channel service experience. As it relates to personalized, intuitive, and efficient self-service, we think the sky’s the limit. The digital revolution has had a massive impact on people’s expectations related to customer service, and intelligent apps and web self-service are becoming the go-to for customers who want fast, effortless access to accurate information. This is core competency for True Image — here’s a free PDF we created called “The Service Journey of the Future” that goes into more depth. Not only that, but customers are beginning to expect companies to not just react when a need arises, but proactively recommend solutions based on an individual’s past activities and personal preferences — a huge opportunity for big data and AI to deliver wow-worthy, low-effort service. But even as these digital conversations become increasingly common, the fact remains (and psychology research confirms): People relate best to people. So, if you want to not only scale your service delivery with automation, but also connect with people to increase engagement and build brand loyalty, interactive communication with a HUMAN avatar is the key. As companies adapt to leverage new technology and improve customer experience, Gartner mentions five major focal points to enable the new capabilities and business models of digital business: information systems, customer experience, analytics and intelligence, the IoT, and business ecosystems. Nate serves as the Director of Marketing at True Image Interactive, where he spearheads the effort to share how our team of mind-blowingly smart individuals is bridging the gap between people and technology and creating some truly remarkable results for our clients.